The label should say Future-compatible and be green. /cc @designakt @atsay for alternative suggestions. The label should link to a SUMO page (to be set up) explaining what it means. Any possibility for a tag added? That's a good idea, and it looks like we already have some code for that for "restartless". @diox, can you check if what we did for the reserved "restartless" tag can be extended for a second tag? @jvillalobos could another possibility be to add a "deprecated" label to non-webext? I'd worry that "Future-compatible" is a bit abstract. Pretty sure the restartless (and maybe jetpack) tag has been broken for a while (not being updated) but the mechanism is sound, I can re-use it yeah. I'll also add something to the API. Does 'future-compatible' translate easily to other locales easily? Can we maybe highlight them by using something like https://www.dropbox.com/s/jrs2b5xmod0c7b7/Screenshot%202017-03-30%2015.58.06.png?dl=0 which is what yelp uses to indicate "hotness". That way we can highlight webextensions without getting into the messy web of compatibility. I don't think an icon will help make the flag more understandable, but it gives me the idea that there should be a hover text expanding on what it means. Ping @devaneymoz + @pwalm for input on this, since this labelling is a combination of UX + editorial. It's my understanding this label will only be a temporary thing displayed during the ramp up to 57, then it goes away. And it's further intended to speak to the leading edge tech audience, so I think that gives us some leeway to be more esoteric with language. ... or maybe just go with WebExtension despite our being wired to not consider it a user-facing term. If this label is only going to be temporary anyway, what's the issue? Also, might we introduce more confusion by labeling a WebExtension something other than WebExtension when the purpose is to alert the tech forward crowd that this is a WebExtension? Could you say "Firefox 57+" compatible? I'd like to avoid using the term WebExtension if it all possible. We could force all non-WebExtensions to not have compatibility beyond Firefox 56, inside AMO. And then just do a lookup to determine which version it works on. @andymckay that's not a bad idea. It might read better as "Compatible with Firefox 57+"
I apologize for the bike-shedding, but I am not a big fan of any of those proposals. "Compatible with Firefox 57+" exposes Firefox version numbers, which are pretty opaque/meaningless/confusing for end-users. I suspect most end-users don't know which version they are running. "Webextension" has similar issues. What is a "WebExtension" for a end-user ? I think that ultimately the issue here is that we don't market WebExtensions to end-users (and we don't really warn them about the impending changes in 57 - we warn developers) ; The "requires restart" label has meaning for them, but I suspect it will be hard to find a similarly meaningful wording for WebExtensions as long as we don't educate users about what they are and provide for them. @diox What about adding dev.addons.mozilla.org? https://dev.addons.mozilla.org/en-US/firefox/addon/bulk-media-downloader/ -- To show additional information on the page for developers. This issue is not about showing additional information to developers, it's about adding it to end-users. I'll add the information to the API and developers will be free to use an extension or whatever they like to display it, but this is not what we are worried about here. I think "Compatible with Firefox 57+" has become the top choice. The "future" options sound like we're promising too much, and we really don't want to use "WebExtensions". For the tag I suggest we use "firefox57". For the hover text, I'm suggesting "This add-on is built on new technology that is compatible with future versions of Firefox." I wouldn't use "future" here either. I suggest this: "This add-on is built with new technology that is compatible with Firefox 57 and beyond." What about "Multi-Process" tag to indicate addon is Multi Process Compatible?! That could be a good starting point for the time being and the data is already embedded in the addon details. These links don't work neither if clicked from the comment or from webext details page using "Compatible with Firefox 57+" link. I think I have to wait until next week, @diox? I'll reopen this until the redirect links will be fixed to better keep track of changes. Verified the other things on AMO-dev using FF52(Win 7). I don't control those links so I simply don't know. @atsay can you look into that? When I started to test this, I saw the tag "firefox57" in add-ons details page. 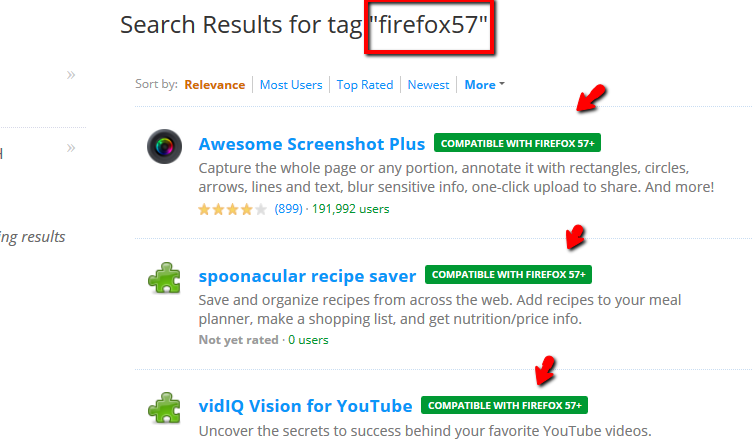 Searching by this tag returned all add-ons compatible with 57+, and I consider it very helpful, but that was yesterday, today, no tag. Do you know something about this, @diox ? I ran the command to add the tag to existing (public+listed) webextensions on dev and stage but somehow they were not indexed after that, so they have the tag but don't show up when searching for it (https://addons.allizom.org/en-US/firefox/tag/firefox57 and https://addons-dev.allizom.org/en-US/firefox/tag/firefox57) yet. I'm currently reindexing both dev and stage to see if that fixes the issue. Reindexing somehow made things worse, investigating. Ah, just had to wait. Now everything should be working, @ValentinaPC ; you can see the tag on webextensions detail pages and you can search for it. Verified the tag part on AMO-dev FF53(Win 7) and seems to work as expected. Tag is automatically added for new submissions, listed for already submitted webextensions and search by tag is returning all compatible webext. Leaving this open because of the redirection links. It will automatically redirect to the different locales. Just be aware that we might have to change the link when we move back to the new platform, but the above link will work in the interim. We'll keep you posted of that though." Since we have until next week to push out the links, maybe we should wait a few days to see if they move back to the new platform? Perhaps if we don't hear back by Tues we should just go with this one. Crap, I missed that. So what's the status, which link should we be using come Thursday (date of our push)? I can change it and cherry-pick into our tag, I just don't want to go back and forth. Verified as fixed on AMO-dev FF53(Win 7). @diox : the part about the firefox57 tag was not pushed to prod?